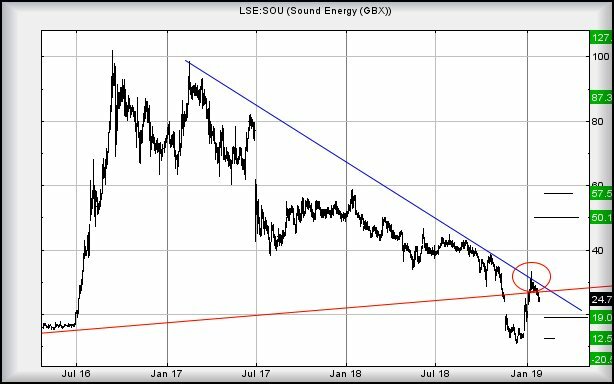 Sound Energy #Nasdaq #CAC40 As a share which, by most standards, is presently trading in very dangerous territory, Sound is actually exhibiting some surprising potentials. But don’t get us wrong – the Big Picture warns this has serious drop potentials, so it is risky! The immediate situation suggests the threat of ongoing weakness below 24p leading to an initial 19p. If broken, our secondary calculates at 12.5p, rather effectively matching the low at the end of last year. In the event such a disaster occurs, we would anticipate a bounce at such a level. Circled on the chart is something which happened at the start of this year. For some reason, the price was permitted to travel beyond the immediate downtrend. Despite the share closing the session below BLUE, we wonder if this surge to 33p should be taken as early warning for some coming recovery. After all, the market just “proved” the downtrend was not sacrosanct. If we adopt a belt and braces approach, the share actually requires better 35p to convince something positive is happening. Surprisingly, movement beyond such a trigger level allows recovery to an initial 50p. If bettered, our secondary comes out at 57p and a point where the visuals suggest a glass ceiling awaits. As for the longer term, we would require re-examine the numbers if 57p makes an appearance. For now, worth watching we think.